In previous years I haven't really done anything for St. Patricks Day but this year I've seen quite a few fun ideas so I figured we'd have a fun rainbow filled day. Maybe Micah will even pick up on some colors this way? We started with a scavenger hunt for leprechaun treasure. I downloaded Shamrocks for the clues from The Crafty Chicks and also got the idea for some footprints to follow from them as well. 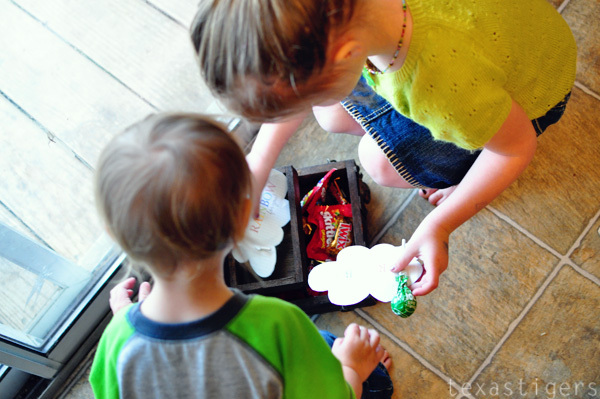 The treasure chest was filled with some gold (twix bars) and skittles as well as a lollipop on the cute little printable you see below. Abby really enjoyed following the footprints and clues. Micah followed along and was adorable as he bent over a little pretending to be sneaky just like big sister was. Then after a leprechaun lunch from Meet the Dubiens (which Abby loved!) 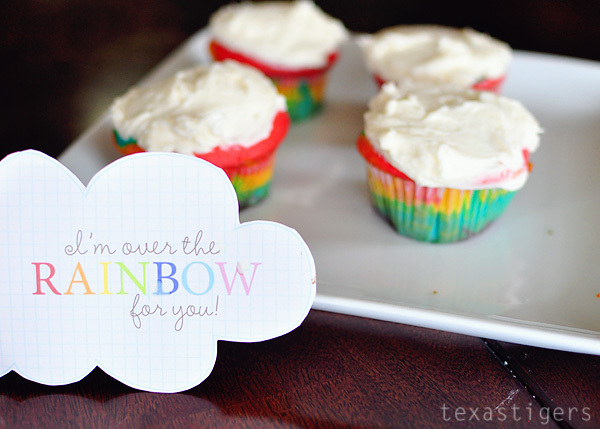 we made some rainbow cupcakes (idea also from Meet the Dubiens) Normally I am not huge on using loads of food coloring but I knew the kids would love these so just for today lots of food coloring. 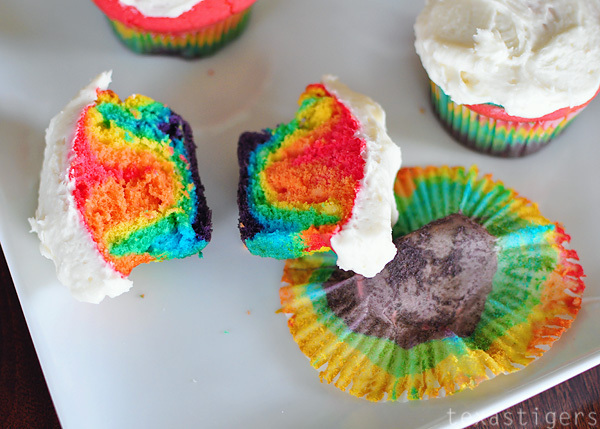 MMM... rainbow goodness. The kids loved them! Me... I'll stick to just eating some frosting. I tried to pipe it on for more of a 'cloud' effect but that didn't work so well so I just frosted them with a knife. I think I would have been better off (read wouldn't eat so much buttercream frosting...) just icing them with some whipped cream. I do know we could find some bluebonnets for the color blue - I finally saw some in the field we took pictures in last year. Not as many as last year - maybe soon? Or maybe not as we haven't gotten as much rain. I hope we get a few more as I want to take pictures again! Sounds like you guys are having a very fun St. Patrick's Day! Great ideas!